Engineering Holding, the leading provider of commercial aircraft maintenance services in Russia and the CIS, has reported its 2017 results. Its subsidiaries S7 Engineering and Sibir Technics demonstrated an increase in man-hours, but the number of completed checks declined. S7 Engineering (based at Domodedovo and Mineralnye Vody airports) and Sibir Technic (at Novosibirsk’s Tolmachevo) jointly passed the significant milestone of 2 million man-hours in 2017. The closest Engineering had ever got to this mark was back in 2014, when it reported 1.9 million man-hours. This makes last year’s 2.026 million a new record for the company. Engineering positions itself primarily as a provider of heavy maintenance forms. In 2017, S7 Engineering and Sibir Technics completed a total of 67 C-checks (down from 85 in 2016) and 26 D-checks (up on 24 the year before). The total number of C- and D-checks was 93, down from 109 in 2016. This decline was due to the increased complexity of the tasks the company faced last year, Igor Panshin, deputy general director for planning and sales, told Russian Aviation Insider. The more labor-intensive work at Engineering’s Mineralnye Vody base, for example, included so-called redelivery checks in the interest of leading international lessors GECAS and SMBC Aviation Capital. The paint shop at Mineralnye Vody redelivered 22 repainted aircraft to their operators (down from 29 in 2016). The figure dropped due to an increase in the number of long-term contracts and the 2017 overhaul of the facility. Engineering explains that it had been keeping slots reserved for Rossiya Airlines since late 2016. The company had also won a long-term contract from Air Astana, so had to reserve slots for the Kazakh carrier as well. In addition, there was a massive amount of work repainting S7 Airlines’ aircraft in its new livery. Two new aircraft types emerged on the Russian market: the Embraer E170 and the Airbus A320neo. Engineering Holding has been closely involved in accommodating these airliners in service, seeing as both types had been acquired by its main customer S7 Airlines. Russian Aviation Insider earlier reported on the first A-checks completed on the carrier’s Embraers by Sibir Technics. No information has yet been released as to the maintenance history of the operator’s A320neos. It is known, however, that S7 Engineering’s training center has been preparing maintenance personnel for servicing the new Embraers and Airbuses since last year. Director Igor Ivanovsky says his training center was issued with the FAP-289 certificate last summer. The certificate covers 94 programs, including 25 training courses for the Embraer E170, Airbus A320neo, Airbus A330, and Boeing 777. Ivanovsky stresses that the Airbus A320neo training programs are unprecedented for Russia and the CIS. The first theory course was completed in July 2017, followed by hands-on training at S7 Engineering’s Domodedovo base. In February 2016, S7 Engineering obtained the FAP-285 certificate clearing it to service Sukhoi Superjet 100 (SSJ100) regional jetliners. Engineering says it significantly increased its presence on the SSJ100 MRO market last year, having won contracts from Gazpromavia, the Russian Emergencies Ministry, and the aviation squadron serving Russian officials. This aspect of the company’s business will be further developed in the future. 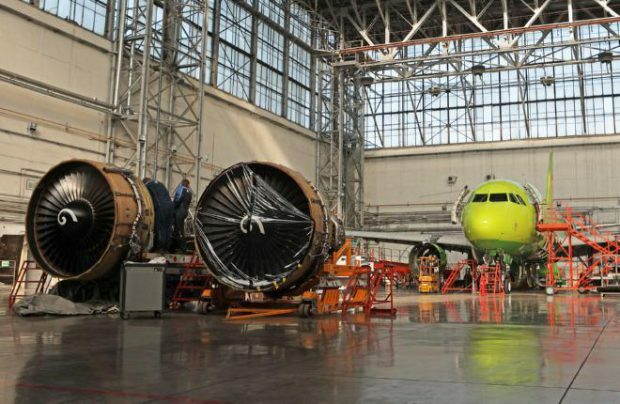 Engineering also intends to add Russia’s future Irkut MC-21 narrowbody to its certificate. In the summer of 2017, Irkut Corporation said that S7 Engineering’s MC-21 maintenance proposal had been shortlisted. Some insight as to Engineering’s plans for this year can be gleaned from the comments by CFO Roman Fyodorov, who says the company is evolving into a center of competence for the heavier MRO forms and is in currently in the process of serious transformation. Fyodorov points out that Engineering is striving to diversify into new business activities. The company is running a number of internal projects; these might not have a visible effect on its 20118 performance, but are expected to boost production output starting from 2019.